I have returned to the Bay Area to retain my membership in Club 122 with a visit to Levi's Stadium today. When the NFL schedule first came out, I immediately circled this weekend, with the 49ers hosting the Chargers on Saturday and the Bills in Oakland on Sunday. With San Francisco a six-hour flight from NYC, two days is too tiring of a trip, so I also took Friday off and flew on Thursday night, giving me another day to find a sporting event in the area. 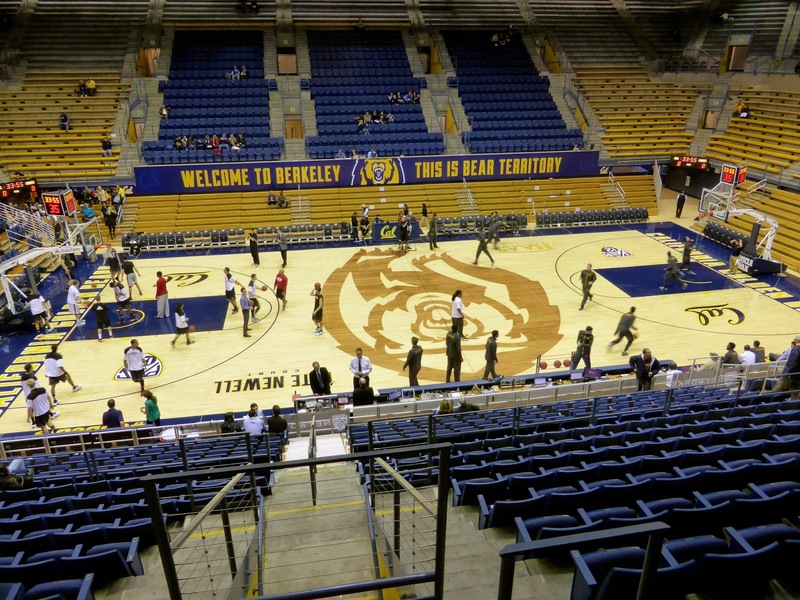 I originally planned to drive to Stockton to see an ECHL game, but upon reviewing the NCAA basketball slate for Friday evening, I discovered that the Cal Bears were hosting Eastern Washington in Berkeley. With tickets just $5 and Berkeley about 30 miles closer than Stockton, I made an executive decision and drove the 50 miles north from Santa Clara. Even leaving at 2 pm saw us (Sharpy has joined me on this trip) hit major rush hour traffic and what should have been a 45-minute jaunt took nearly two hours. In the end, this worked well though as we found street parking with a two-hour limit that expired at 6 pm. Perfect. Leaving the car at 4 pm, we enjoyed a couple of beers at Jupiter, a wonderful brew pub just a couple of blocks away from the venue. 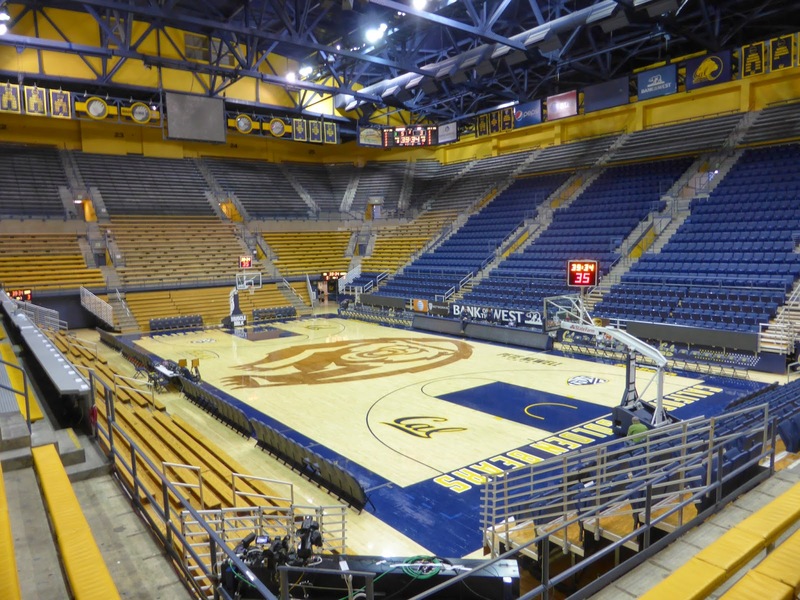 Before that, we did check out Haas Pavilion, home of the Golden Bears. 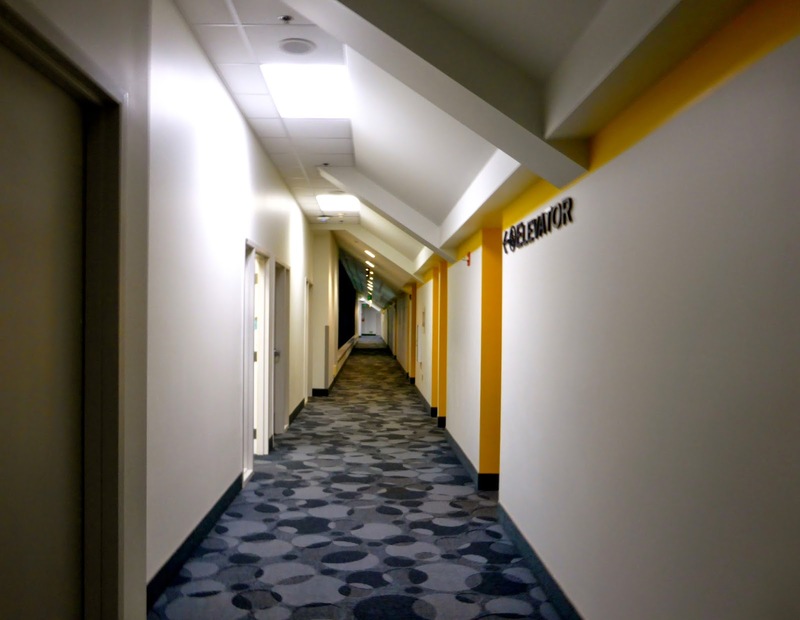 Named for Walter A. Haas, Jr., who once owned the Oakland A's, it was originally built in 1933 and known as Harmon Gym until it was extensively renovated between 1997 and 1999. A new seating bowl was built inside the existing walls, nearly doubling capacity to 11,877. Although the ticket office was not open, we were able to walk around the facility without being kicked out, allowing for some pictures of the empty seating bowl (below). Note the very steep sideline seats, you are right on top of the action here even in row 25. 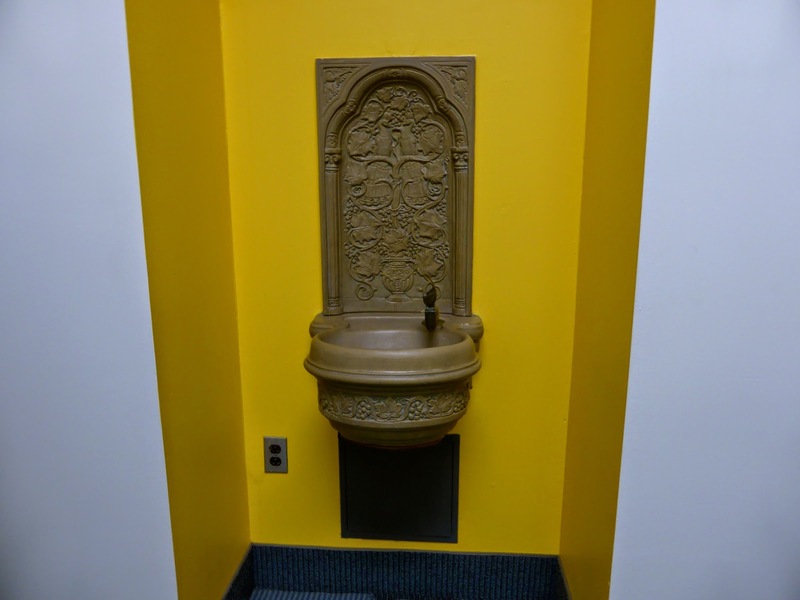 Wandering around the very narrow, carpeted upper concourses (above), I spotted an old fountain (below) that had been maintained, one of the few signs that the underlying structure was over 80 years old. Inside the seating bowl, the center seats have chairbacks and ran as high as $70 for this game and will be even more when conference games get underway. As Eastern Washington was in town, there was a special with corner seats just $5. As the place was less than half full, this was the obvious option, as we were able to move to a better seat after the first TV timeout. 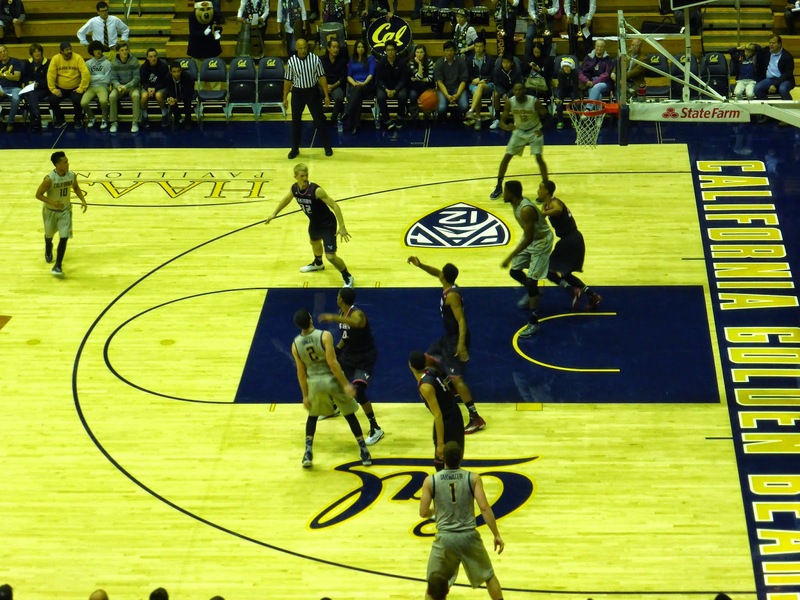 Note the five rows of gold benches courtside below - this is known as "The Bench", and is a student section, where the band also sits. I love the fact that the this power conference university forgoes revenue opportunities to allow their students to fully enjoy the athletic experience. Near the end of the game, we moved to a baseline seat, which isn't great because the opposite basket is blocked by the shot clock. 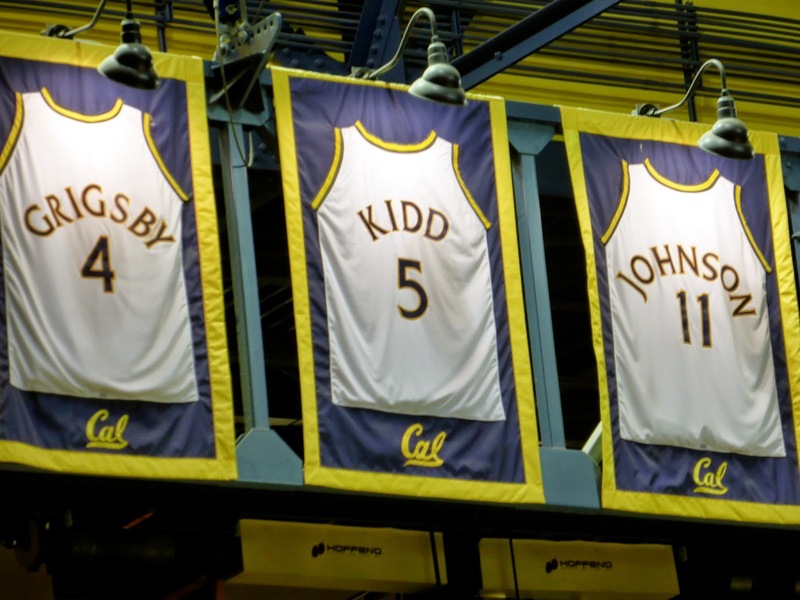 Cal has had several good teams over the years and even won the 1949 NCAA title, but their most famous alumni are Jason Kidd, now coaching in Milwaukee, and Kevin Johnson, now mayoring in Sacramento. 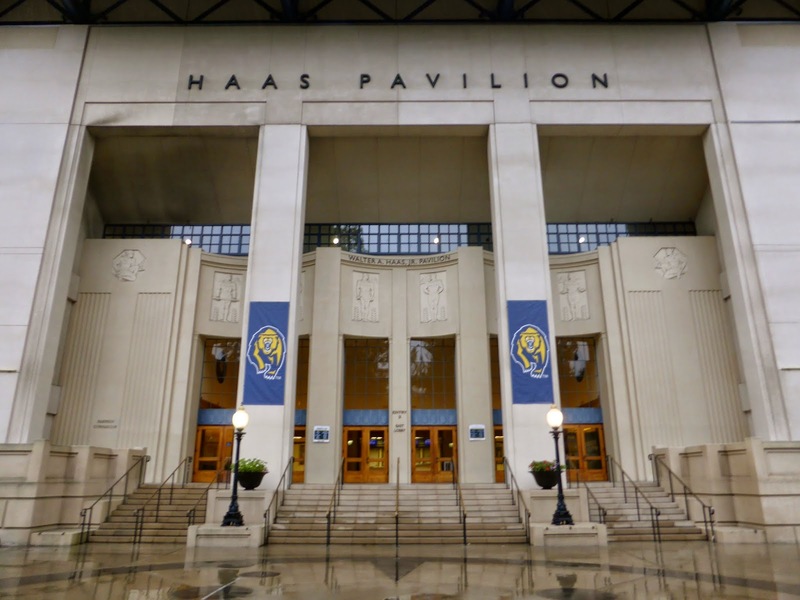 Other than the food (I tried a tasteless bacon-wrapped hot dog that wasn't worth seven cents never mind $7), I was very impressed with Haas Pavilion. They managed to retain a historic building while turning it into a contemporary venue, keeping the interests of the student body in mind as well. 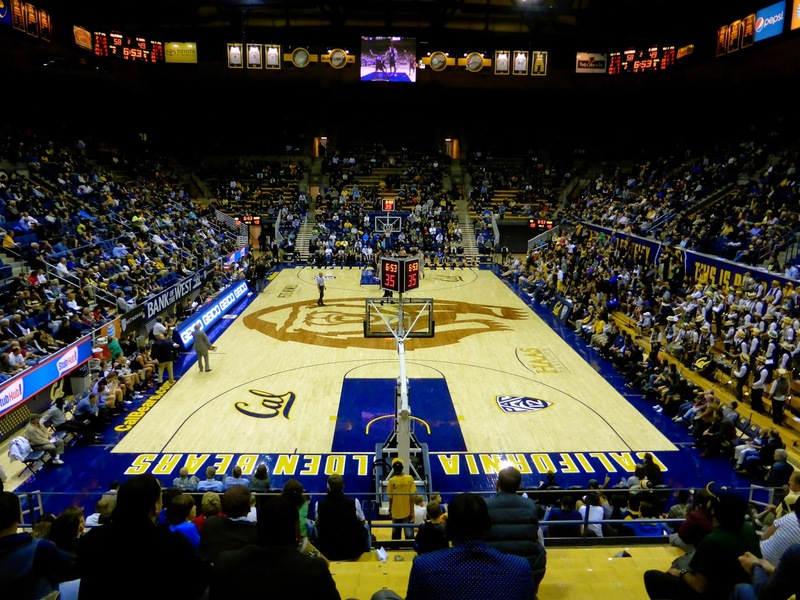 Superb place to watch quality college basketball and a must-visit for any fan of the game. Eastern Washington were the visitors, coming in with a 8-3 record, while Cal was 9-1, their only loss against Texas at the 2K Classic last month. The Bears have not played too many strong teams, with their win over Syracuse that I partially attended their only top-50 RPI scalp. 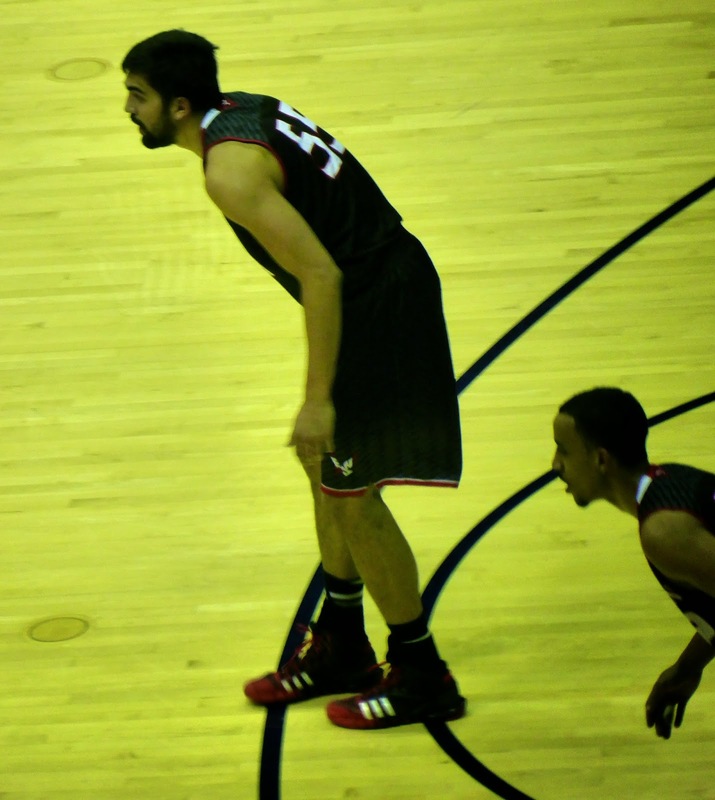 The player to watch for the Eagles is Venky Jois (below), a junior forward from Australia whose .603 FG percentage was in the top 75 in the nation. Jois scored 9 points early as the Eagles broke out to a 12-9 lead, and then Tyler Harvey added a couple of treys and a layup to make it 21-14 midway through the half. Cal then turned on the defense and spent the rest of the half on a 23-5 run to take an 11-point lead into the break. The second half started much the same as the first, with Jois and Harvey combining for 17 points as Eastern Washington climbed back into the contest, trailing just 51-49 with 9:41 to go, but that was as close as they got, as Cal went on a quick 9-0 run to regain the 11-point advantage, and the rest of the match was evenly played as the Golden Bears won easily, 78-67. Note that Harvey (#1) and Jois combined for 54 of the Eagles 67 points. Basketball is a team game, and the rest of the team will need to get involved if they are to make any noise in the Big Sky this year. Meanwhile, Cal might sneak into the top 25 if they continue to win, but with #5 Wisconsin in town on Monday, it will be a tough task to get there before the new year. Whatever the case, I've become addicted to college hoops, with 351 Division I teams, this is a sports roadtrippers dream. At just over 3 months, the schedule is too short to see more than 50 games in a season (not that I will ever try) so you'd be looking at 7 years to get all these done. I've seen 19 so far, so still a long way to go. My Club 122 membership remains active as I am visiting Levi's Stadium today. Check back tomorrow for a recap!